Researchers from Iowa State University are developing wireless soil sensors that will improve farming and may help grow our understanding of the increasingly important carbon and nitrogen cycles. The sensors could also help determine the effects of biochar added to soils. Interestingly, the sensors can be buried deep in the soil and transmit data without above-ground antennas. The technology could play an important role in precision farming. Researcher Ratnesh Kumar leads the team that's developing transceivers and sensors designed to collect and send data about soil moisture within a field. The scientists are tweaking the sensors in such a way that they will also collect data about soil temperature and nutrient content. A major goal is to build small sensors (the prototypes are about 2 inches wide, 4 inches long and less than an inch thick) that can do their work entirely underground. The sensors won't need wires or above-ground antennas, so farmers could work right over the top of them. The sensors would also be able to report their locations. That would make it easy to find sensors if a plow were to move them or when batteries need to be replaced. Kumar, an Iowa State professor of electrical and computer engineering, said the sensors are designed to be buried about a foot deep in a grid pattern 80 to 160 feet apart. 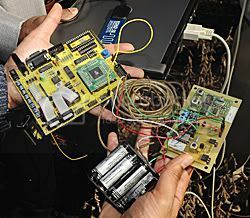 The sensors would relay data along the grid to a central computer that would record information for researchers or farmers. The sensors could help researchers understand precisely how water moves through a field. They could help them develop better models to predict crop growth and yield. And they could help them understand the carbon and nitrogen cycles within soils. Kumar adds that the sensors have worked underground in preliminary, point-to-point tests. A network of multiple sensors will be buried in a research field later this fall for more testing and development. Also working on the project are Ahmed Kamal, a professor of electrical and computer engineering; Robert Weber, the David C. Nicholas Professor of electrical and computer engineering; Amy Kaleita, an assistant professor of agricultural and biosystems engineering and graduate students Candace Batts, Giorgi Chighladze, Jing Huang and Herman Sahota. The project is supported by a three-year, $239,999 grant from the National Science Foundation. The goal is to have these sensors in production agriculture. But first the researchers need to develop them and answer more questions about how cost-effective they could be. Large picture: These nine researchers are working to developing a wireless network of soil sensors that could one day help farmers collect and track soil data. In the back row, left to right, are Amy Kaleita, Candace Batts, project leader Ratnesh Kumar, Jing Huang, Robert Weber, Ahmed Kamal and Stuart Birrell. In the front row, left to right, are Herman Sahota and Giorgi Chighladze. Credit: Bob Elbert.